World Jewish Congress Director calls on Jewish leaders from all over Europe to take action against Hamas. 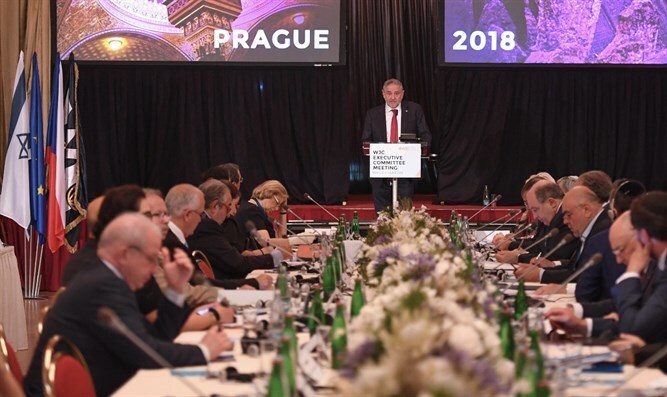 World Jewish Congress Executive Director Robert Singer called on Jewish leaders from all over the world to participate in a conference by the organization in Prague to act with all their might in their countries against Hamas, following the increase in kite terror. "This is the time when the international community must wake up and understand the great danger in the actions of the Hamas terror organization. At this moment a huge fire is raging close to Sapir College in the south of the country following a flaming kite that was sent from Gaza to the territory of the State of Israel. "If it wasn't clear until now, at last it's clear that these attacks are intended to harm and terrorize Israeli civilians. Kites are supposed to be children's games, but in Gaza under Hamas they've become weapons of mass destruction," Singer said. The conference was attended by the Chairman of the Knesset Foreign Affairs and Defense Committee MK Avi Dichter, to whom Singer turned and addressed, "We support the State of Israel and together we'll spread the message in communities around the world. "I call upon the leaders of the European countries to act against Hamas, to denounce its actions, and to recognize it as a terrorist organization in every respect. We must stop Hamas once and for all," Singer concluded.